Suzuki in India has been always known for making scooters such as Activa and Swish and then they launched the Let’s it was another addition to the highly competitive entry-level scooter from Suzuki. The 110cc sub Rs. 45,000/- category is filled with a lot of competition from rivals such as TVS, Honda and Yamaha.Let’s did good initially but it hasn’t been exactly successful despite being fantastic product. Today company has announced dual paint schemes and graphics addition for the Suzuki Let’s . The Suzuki Let’s always looked on the smaller side, showcasing the fact that its best for women and short height-ed riders. With new schemes it does look sporty and does remind us of the Ray-Z very strongly in terms of graphic. The Suzuki Let’s is available in three all-new colour schemes such as Matte Grey with Matte Black , Pearl Mira Red with Matte Black, Pearl Suzuki Blue No.2 with Matte Black along with the classic Pearl Mirage White is also a new color which has made in the offering from Suzuki. 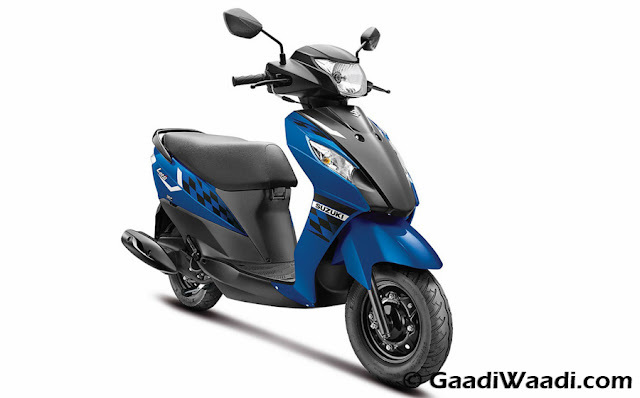 Suzuki has also blackened the wheels to add to sporty stance along with the exhaust shield and telescopic forks. 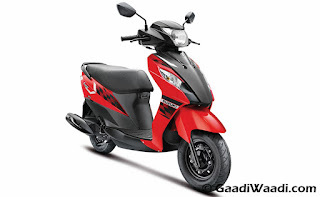 Let’s returns a claimed ARAI fuel efficiency of 63 km/l. 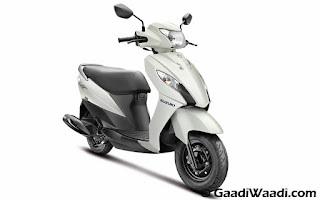 Suzuki Let’s continues to be an impressive package and this should help as its value quotient becomes higher. The Suzuki Let’s now comes at a price of Rs. 46,597 (Ex showroom, New Delhi).